Often described as one of the most colorful characters in North Dakota politics, it would perhaps be more fitting to say that William Langer is one of the more colorful characters in United States political history as a whole. Throughout every step of his career, from state judicial offices to the U.S. Senate, Langer was dogged with accusations of overstepping his power and ignoring the rule of law. At the same time, he was an immensely popular figure credited with looking out for the interests of the downtrodden at the height of the Great Depression. Langer was born on a farm in Everest Township, near Casselton, North Dakota, on September 30, 1886. He attended the local schools and graduated as valedictorian of Casselton High School's Class of 1904. He completed his studies in the law department of the University of North Dakota at Grand Forks in two years, graduating in 1906. Although he passed the bar exam in this year, the state did not allow people to begin practicing until they were 21 years old. Rather than waiting out the extra time, Langer decided to travel to New York City to further his education at Columbia University. He again graduated at the top of his class in 1910 after serving as the class president. Despite an offer of employment at a New York firm, he decided to return to his home state. He was admitted to the bar in 1911 and began a practice in the city of Mandan, a neighbor to the capital of Bismarck. After serving as assistant state's attorney of Morton County in 1914, Langer was appointed as state's attorney in the same year. He lost no time in aggressively pursuing a number of causes, namely enforcing North Dakota's ban on alcohol. He reportedly swore out 167 arrest warrants against liquor dealers and vice operators on his first day in office. He filed suit against the Northern Pacific Railway, charging them with underpaying their state taxes, and managed to recoup $1.25 million; similar suits were filed against Standard Oil and the Occident Elevator Company. Langer also went after parents whose children were not abiding by the state's compulsory 16-year school attendance law. As a result, 800 parents received letters saying they were in violation of this statute because their children were not in class. In addition, Langer advocated for a number of improvements to the school system, including transportation for any students who lived more than two-and-a-half miles from their school and fire guards at the school buildings. In pursuing justice, Langer's zeal sometimes extended outside the limits of the law. This would prove to be a persistent habit, one which would give his critics plenty of ammunition in later years. After easily winning election as North Dakota's attorney general in 1916, carrying every county in the state and earning 58,000 more votes than his nearest competitor, he continued his campaign against prostitution and bootleg liquor. On the evening of May 7, 1917, he made the questionable decision to have deputies take over the Northern Telephone Company in advance of a series of raids on vice dens. His rationale was that silencing the phone lines would prevent anyone from warning the targeted establishments. Tensions quickly arose between the lawmen and the telephone workers, and an attorney for the company was accused of pointing a gun at one of the deputies. A number of charges were filed in the wake of the excitement. Langer and two deputies were charged with obstruction of justice and inciting a riot. The attorney, L.J. Palda, was charged with assault with the intent to kill. The cases eventually petered out, in part due to the entry of the United States into World War I. Langer would serve as the legal adviser for the Council of Defense during the war, and one of the deputies charged in the incident traveled overseas to assist in the assembly of tractors for the French government. The charges against Palda were dismissed, and Langer was tried and acquitted on the inciting a riot charge. In the midst of this clamor, the Nonpartisan League—a faction of the Republican Party—declared its support for Langer's actions in a unanimously adopted resolution. Langer won re-election as attorney general in 1918, running on the Nonpartisan League ticket while endorsed by the Progressive Republicans. Among his other actions in office was the censure of 275 schools in the state for failing to display the American flag. Despite his popularity, Langer was nearly ousted from office during his second term. He split from the Nonpartisan League in April of 1919, saying to party founder Arthur C. Townley, "You and your hirelings have lied to and are deceiving the farmers of North Dakota." In November, Langer and state auditor Carl Kositsky began distributing a magazine entitled The Red Flame, which described the NPL as being a Communist organization. A month later, as the NPL targeted the budgets of Langer and his allies while removing them from certain boards where they held power, a formal request to remove Langer from office alleged that he had "betrayed the farmers of this state" and tried to undermine banks friendly to farmers. The accusation also said he had described Governor Lynn Frazier and the state supreme court justices as "crooks and conspirators." An attempt in the legislature to impeach Langer fell short by a single vote. On March 23,1920, Langer announced that he would seek the nomination for governor of North Dakota. He had the support of the Progressive Republicans as well as the Independent Voters Association, a bipartisan group opposed to NPL influence in state politics. After losing the Republican primary by fewer than 5,000 votes, Langer returned to private practice and moved his business to Bismarck. Although he later reconciled with the NPL, he lost an attempt to be nominated for attorney general in 1928. In 1932, Langer was elected as governor of North Dakota on the NPL ticket. The incumbent Republican governor, George F. Shafer, made a bad misstep when he threw his support behind President Herbert Hoover. Although Hoover and Shafer shared the same political party, Shafer had also expressed his opposition to any government relief to alleviate the hardships of the Great Depression - a platform championed by Democratic candidate Franklin D. Roosevelt. Thousands of suffering North Dakota voters threw Shafer out of office, and the state (and an overwhelming electoral vote) went to Roosevelt in the presidential election. When he took office in January of 1933, Langer sought to take whatever steps possible to counter the effects of the Great Depression in North Dakota. He cut state appropriations in every department except education and declared a moratorium on foreclosures, going so far as to call out the National Guard to stop sheriff's sales. In an effort to support farmers in the state, he declared an embargo on shipments of wheat and beef out of North Dakota until the prices rose to a satisfactory point. He again used the National Guard to support this action, which a federal court later declared unconstitutional. Though these actions earned Langer high standing in the minds of the general populace, especially the farmers, they made him plenty of enemies elsewhere. The railroads, grain syndicates, and electricity companies were all irked that the governor had forced them to lower their rates. Langer was also an unabashed loyalist, clearing out several executive departments and replacing their employees with people who had supported him. He was a strong critic of the New Deal, accepting the federal relief effort but criticizing its programs as not doing enough to help the poor. Divisions again developed in the NPL during Langer's first year in office, and the party's executive committee was soon at odds with the governor over the distribution of state patronage jobs. Because of this split, there would be rumors that Langer was the target of a conspiracy to oust him. In addition to his enemies in the NPL, it was suggested that Secretary of the Interior Harold Ickes and federal relief administrator Harry Hopkins were eager to get Langer out of office. No matter what the origin of the investigation against him, Langer soon found himself in trouble over a fundraising scheme he had concocted. After he became governor, Langer revived the Leader, an NPL newspaper which had folded in 1932, as a publication to represent both the party and his administration. Many farmers in the state were already paying a membership fee to be part of the NPL, and the reintroduction of the paper simply meant that they would get a subscription to the Leader as part of their dues. Langer caused more controversy when he began to ask the members of his administration who owed their jobs to his 1932 election to contribute five percent of their salaries toward a Leader subscription. By soliciting donations from people who were working in the state relief offices and receiving part of their salary from the United States government, the activity passed from a state matter to a federal one. In the spring of 1934, Langer was indicted by a federal grand jury for "soliciting and collecting money for political purposes from federal employees and of conspiring to obstruct the orderly operation of an act of Congress." Eight others were indicted alongside him, including state highway commissioner Frank A. Vogel, relief secretary R.A. Kinzel, and Leader publisher Oscar Chaput. Langer and his supporters denounced the indictment as being "politically inspired," as the charges happened to arrive just a few months before the primary for the 1934 election. The defense pointed out that one grand jury had declined to indict Langer and his co-defendants, and that the charges only came down after a second grand jury was handpicked to include an overwhelming number of people opposed to the NPL. The judge in the case, Andrew Miller, was also a former political opponent of Langer's. During the trial, the defense maintained that no one had contributed a portion of their salary unless they wanted to. The request for donations had been clearly published in the paper, and anyone who didn't contribute had not been punished in any way. The prosecution showed that six employees out of 30 employees had donated a portion of their salary, accounting for a sum of less than $200. However, the records also indicated that $12,000 had been transferred from the Leader's books to Langer's personal bank account. Taking the stand in his own defense, Langer admitted that he had received $19,000 through solicitations. However, Miller refused to admit testimony arguing that these funds were a repayment for a loan Langer made to the NPL. Langer said he had made the $12,000 transfer to his own account only to prevent its attachment by a hostile NPL executive committee. He also claimed that he had no role in the distribution of relief funds or taking funds from these salaried employees, since he had delegated relief responsibilities to a five-man commission of 1933. After a month-long trial, Langer, Chaput, Kinzel, and Vogel were found guilty on June 17. Five days later, Hopkins removed Langer as head of federal relief activities in the state. The verdict had no effect on the primary. On June 27, Langer easily won the Republican nomination. He carried 48 of the 53 counties in North Dakota and tallied 65,646 more votes than the nearest candidate. Two days later, Langer was sentenced to serve 18 months in prison and pay a $10,000 fine. Each of the three co-defendants received a 13-month sentence and $3,000 fine. Harold McDonald, who had actually solicited the donations, would be sentenced to only four months in prison. Langer's bond was set at $20,000, and a sympathetic farmer offered this sum to keep the governor out of prison as his appeal proceeded. The conviction set the stage for a titanic power struggle in North Dakota. Lieutenant Governor Ole H. Olson contended that Langer had been disqualified from holding office, meaning Olson would have to take over as governor. He promptly took the oath of office and filed it with the secretary of state, but North Dakota Attorney General P.O. Sathre said Langer would remain in power at least until his sentencing. Supporters of Olson countered by appealing to the state supreme court, which also said they would not make a decision until after the sentencing. The situation further split the NPL, with some members rallying behind Langer and other supporting Olson. Some members of Langer's administration bolted immediately after his conviction, saying they would refuse to abide by any of his executive decisions until the courts clarified the issue. These officials included Robert Bryne, the secretary of state; John Husby, the labor and agricultural commissioner; and Alfred Dale, the treasurer. Langer was not about to give up his position easily. He stationed sheriff's deputies around his office, instructing them to bar entry to anyone who did not have his permission. On July 12, Langer asked the state legislature to convene in exactly one week. Only they had the power to investigate him, he declared; if they found him guilty of any crime, they could remove him by impeachment. The statement provided an impetus for the North Dakota supreme court to finally rule on the issue, since they needed to decide whether Langer still had the authority to call a meeting of the legislature. On July 17, in a 4-1 decision along party lines, the justices announced that Langer's conviction on federal charges had disqualified him from office. Langer took a heavy-handed response. He declared martial law, ordering troops to be stationed around the state capitol. Ostensibly, calling out the National Guard was a way to prevent disorder by his supporters, who had been demonstrating in Bismarck. This was also the reason Langer gave for sending soldiers to surround Olson's hotel, since there were rumors that angry pro-Langer farmers were going to march on the city and uphold Langer's legitimacy by force if need be. However, declaring martial law also had the effect of prolonging Langer's rule since the military authority of the National Guard would supersede the civil authority of the courts. An hour before declaring martial law, Langer had taken an even more drastic approach to staying in office. Holing up in the governor's mansion, he drew up a declaration of independence for the state of North Dakota. If the issue was that federal charges had made him unfit to govern the state, he reasoned, he could make this issue null and void by simply seceding from the United States. Twenty-six of his closest supporters signed the document with him. Once the state supreme court justices heard of this would-be defection, they visited Langer personally and managed to convince him of the absurdity of this strategy. The next morning, a peaceful transition of power took place. The state adjutant general announced that he accepted the court's ruling and that the National Guard troops called by Langer would no longer answer to him. Olson, who now had a stronger claim to the governor's office, immediately canceled the order of martial law and called off the special legislative session scheduled for the next day. On July 19, accompanied by soldiers with the National Guard, he walked into the governor's office for his first full day on the job. The drama was not yet over, however. At the urging of the ousted governor, the state legislature defied Olson's order and assembled later in the day. Several legislators were out for revenge, threatening to impeach any state officials—including Olson and the state supreme court justices—who had not stood by Langer. The effort fell short, since several anti-Langer state senators abided by Olson's cancellation order and never showed up. Their absence left the chamber five members short of a quorum. The pro-Langer senators tried to strong-arm a meeting by ordering the sergeant at arms to compel these senators to attend by force; the first man was described as giving physical and verbal resistance as he was literally dragged to the legislature. Though Langer's advocates considered bringing the other recalcitrant senators into the chamber in the same way, they realized that the plan would be unpopular and abandoned it. The legislature was forced to recess on July 24, having done little more than adopt a resolution saying that they had met legally and that they had authorized the speaker to appoint an investigating committee to consider the impeachment of state officials. Olson, meanwhile, ran into similar resistance as he tried to expunge Langer's appointees from his administration. When he named a new highway commissioner, Vogel refused to vacate his office and said he could only be removed for cause. Unsurprisingly, Olson was not keen to remain in office in the face of such confusion and hostility; he would fulfill the remainder of Langer's term, but would not be a candidate in the general election in the fall. Though Langer had won the GOP nomination fair and square, he knew that his felony conviction and loss of citizenship rights would set him up for a challenge if he won the election. He opted to step aside in favor of his wife, Lydia. As several commentators pointed out, the strategy was similar to that taken by Texas governor James Ferguson; after his impeachment and removal from office, his wife Miriam "Ma" Ferguson had successfully won the Democratic nomination and subsequent gubernatorial election. Olson and other NPL officials threw their weight behind Thomas H. Moodie, the Democratic candidate, in a three-way race for governor. Although Moodie succeeded in winning the 1934 election, he was soon forced out of office after it was discovered that he hadn't lived in North Dakota for five years as required. The legislature swiftly began an impeachment effort, but it was halted after Moodie agreed to step down in favor of Lieutenant Governor Walter Welford. Despite the continuing effects of the Depression, supporters from all over North Dakota contributed to a legal defense fund for Langer's appeal. The renowned civil rights attorney Clarence Darrow agreed to take his case, though other lawyers had to take over after Darrow fell ill. On May 7, 1935, Langer won his first victory when the Circuit Court of Appeals reversed his conviction. However, District Attorney P.W. Lanier convened another grand jury soon after and again managed to indict the former governor. Langer and his co-defendants also had a perjury charge levied against them after they accused Miller of being biased against them. This was an unprecedented use of the perjury charge, and Langer would later joke that he was the only person who had been charged with the crime for filing an affidavit of prejudice. Langer was seriously injured in a car accident in July, but survived to attend a new trial in October. The jury deadlocked, 10-2 in favor of conviction. Another trial in December covered both the conspiracy and perjury charges. This time, Langer was found not guilty. The proceedings also acquitted Chaput, Kinzel, and Vogel. In in the interim, Welford had built up his own prestige and further cleared the state offices of Langer appointees. The acquittal cleared the path for Langer to again seek nomination for the governor's office, and he directly challenged Welford for the Republican nomination in 1936. After losing this bid by about 500 votes, Langer instead joined the race as the NPL candidate against Welford and Democratic candidate John Moses. He was not nearly as popular as he had been in earlier races, earning only 36 percent of the vote, but it was enough to win in the three-way race. In his second term, Langer successfully convinced the state legislature to appropriate $6 million for child welfare, old age pensions, and general relief programs. The appropriation was more than what had been made in the entire period between 1933 and 1935. He also directed the State Mill and Elevator company to pay above market price for wheat. In a move criticized by the students, alumni, and faculty in the state college system, Langer dismissed seven deans and instructors; some had been employed in the system for 35 years and received only a few hours' notice to leave. The dismissals prompted a brief recall effort, but the mood in the state was somewhat assuaged when Langer introduced a student aid fund. There were lingering corruption allegations during Langer's second term as governor. Three of his friends were found to have purchased county bonds at a discounted price before selling them back to the Bank of North Dakota. In 1938, an investigation determined that an attorney for the Great Northern Railroad had received $25,000 in stock from Langer; the transaction occurred as part of a $3 million reduction in the assessment on the railroad. Langer did not seek re-election in 1938, instead opting to run for the U.S. Senate. He lost the GOP primary to Gerald P. Nye, thanks in part to the persistent rumors about improprieties in his administration, and was an unsuccessful candidate in the general election. Two years later, Langer was again a Senate candidate in a race that featured a bizarre tangle of alliances. William Lemke abandoned his bid to run for re-election to the House of Representatives, instead opting to run an independent campaign against Langer in the Senate race. He hoped to strike a deal with Charles Vogel, the Democratic candidate, where Vogel would not campaign for the seat. Lemke had arranged a similar bargain in 1938, joining Nye in supporting Democratic candidate John Moses; in exchange, Moses convinced Democratic candidate Jess Nygaard to not campaign in the Senate race, thereby avoiding a split in the anti-Langer votes. However, since Roosevelt was seeking a third term in the White House, Vogel feared that such a deal would compromise the vote for the President in North Dakota. He continued his campaign, causing the anti-Langer vote to split between Lemke and Vogel. Langer, running on the Republican ticket, won the Senate race by more than 100,000 votes. Anti-Langer residents in North Dakota gathered signatures for a petition seeking to block the candidate's seating in the Senate. The document outlined the numerous excesses during Langer's time in the state, accusing him of everything from bribery in leasing government property to accepting kickbacks and fees for fictitious services and converting the proceeds from legal settlements. Senate Majority Leader Alben Barkley, a Kentucky Democrat, asked that Langer be seated without prejudice while the issue was referred to the Committee on Elections and Privileges in January of 1941. Putting the task to the committee also meant that the Senate could expel Langer by a simple majority vote rather than a two-thirds majority when the question returned to the chamber. The committee did not begin full hearings until November, and it did not issue its findings until January of 1942. By a vote of 13-3, the committee had decided that Langer was not fit to be a senator and should be expelled. The majority report declared that Langer had exhibited a "continuous, contemptuous, and shameful disregard for the high concepts of public duty" during his time in the North Dakota state offices. "He would defy the highest court of his state with force," the report stated. "[Langer] throughout his career had little use for law and order, but in attempting to prevent and suspend civil process upon himself he reached the high point in his continuous belief that might is superior to right." The majority summarized some of Langer's misbehavior as including "gross impropriety, lawlessness, shotgun law enforcement, jail breaking, violation of oath as an attorney, rabble rousing, breach of the peace, obstruction of the administration of justice, and tampering with court officials." He was criticized for the raids he organized as state's attorney as well as his declaration of martial law and attempt to secede after his 1934 conviction. One of the most bizarre incidents related to Langer's time as a private attorney. He was accused of kidnapping his own client from jail, taking him and his ex-wife across the state line, and persuading her to remarry him so she could not be compelled to testify against the client in a murder trial. Langer had promised to arrange for a divorce without fees once the case had been settled. However, when the woman tried to remarry nine years later she found that Langer had failed to keep his word. Langer himself admitted that he had paid the son of the judge who had presided over his second and third trials in the Leader matter as well as an associate of the judge named Chet Leedom. The majority report determined that he had taken $56,800 in compensation for his approval of questionable bond issues in order to allow a broker named Gregory Brunk to net $300,000 in profits in 1937 and 1938. It also revived the accusation that Langer had received $25,000 for selling stock to the Great Northern Railway Company as part of the railroad's effort to reduce its taxes. Though several of the accusations had been publicized before the report, the majority felt that North Dakota voters hadn't been adequately aware of Langer's tumultuous past and that denying him a seat in the Senate was a proper action. The minority report was just as strongly worded, saying the majority's conclusions about Langer's culpability had been based more on hearsay and gossip than on fact. It was the first time a member of the Senate had been the target of such a pointed investigation, the three minority members said. They accused the committee's investigation of being sloppy and one-sided, focusing on evidence against Langer without taking any that could exonerate him and allowing the process to be "swept away by a barrage of slander." 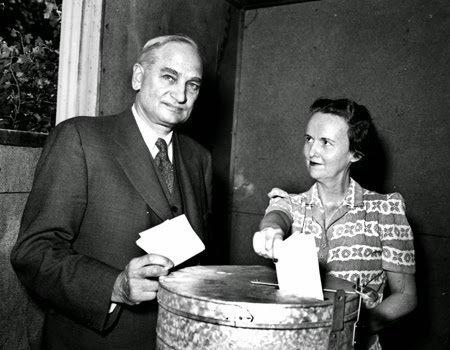 Morever, the minority said the voters in North Dakota were well aware of Langer's lively personality since the same accusations had come up in the 1940 campaign. "[T]he petitioners have evidently adopted the view that if you say enough things about an individual and extend the period of time sufficiently long, and use sufficiently abusive phraseology, those who try the case will finally lose patience in tracking down one false trail after another and give up in sheer exhaustion," one part of the minority report said. Floor debate in the Senate opened on March 9 and continued for two weeks. Langer's supporters said they should not add morality requirements to those outlined in the Constitution when considering whether a member was fit to serve in Congress. Ellison "Cotton Ed" Smith, a Democrat from South Carolina, remarked, "I don't like this business of going back 25 or 30 years into the life of a senator. If we did that for every senator, we couldn't get a quorum here." The Senate first repudiated the idea that Langer could be expelled by majority vote rather than a two-thirds majority, then rejected the majority report on Langer's fitness for office. Fifty-two senators were opposed to his expulsion, while 30 were in favor. In September of 1942, the Senate approved $16,500 to compensate Langer for the legal costs he had incurred during the committee hearings. As a senator, Langer distinguished himself as having an independent streak that often put him in opposition with his own party. Though he supported the declaration of war on Japan after the attack on Pearl Harbor, he was strongly isolationist. In the lead-up to the war, he opposed the Lend-Lease Act, Destroyer Deal, and expansion of the Selective Service Act to peacetime. After the conclusion of World War II, he was one of only two senators to vote against the United Nations charter. Langer's isolationism continued in the years after the war, as the United States became increasingly involved in international affairs in the Cold War against the Soviet Union. He opposed the formation of the North Atlantic Treaty Organization, all foreign aid, and the extension of conscription laws. Though he had kind words for Harry Truman's capability as President, he was against two of Truman's signature policies: the Marshall Plan to assist the postwar recovery in Europe and the Truman Doctrine to promote the containment of Communism. This attitude earned Langer some criticism when he publicly expressed his disdain for former British Prime Minister Winston Churchill on a few occasions. In 1949, critics called Langer out for his erroneous statements claiming that Churchill had fought against the United States in the Spanish-American War. In advance of Churchill's visit to the U.S. in 1951, Langer asked the pastor at the Old North Church in Boston to hang two lanterns in the steeple to indicate that the British were coming. Langer's firm opposition against internationalism was balanced by efforts to improve everyday life for the average person. He supported measures to bring electricity and telephone service to rural areas, and he was also in favor of efforts to make health care more affordable to citizens. He served for a time as chairman of the Judicial Committee, and was always recognizable by his longtime habit of chewing on cigars without removing the wrapper. Langer remained popular in North Dakota, winning re-election in 1946 and 1952. Though he did not drop out of the race in 1958, the Republican Party chose another candidate and Langer never made a campaign speech since he refused to leave his ailing wife's side. Nevertheless, he won re-election in this year as well. Langer continued to serve in the Senate until his death on November 8, 1959. He lay in state in the Senate for his funeral, which took place two days later. He would be the last senator to have this kind of funeral until 2010, when similar proceedings were scheduled following the death of Senator Robert C. Byrd of West Virginia. Thanks to James A. Davis of the State Historical Society of North Dakota for his assistance with this entry.